A travel diary from Athens and other sites of interest, with plenty of pictures. I work as a consulting engineer, a profession which includes a heavy travel schedule as part of the job. It can be tedious at times, interesting at others. Every once in a while, if luck is with you, the travel may be to somewhere neat. On rare occasions, it is to somewhere very special. In this case, it is Athens, Greece, in the second week of September, at the end of the summer tourist season. All photos (except the cover photo) were taken with a Nikon FG camera, using 24 mm f2.8 (Sigma), 50 mm f1.8(Nikon), and 80-200mm f4.5 zoom (Rokinon) lenses, and a 2x teleconverter (Vivitar). Panoramic photos were taken with a Kodak single-use camera. Thanks to Jim Roiux for providing the black and white film and developing and printing the black and white photos. Thanks to Joanne for letting me have a few days to explore a different corner of the world. My purpose in writing this travel diary and placing it online, is mainly to share the experience of visiting the Acropolis, Mycenae, and other places in Greece that most of us never get a chance to see in the normal course of our lives. 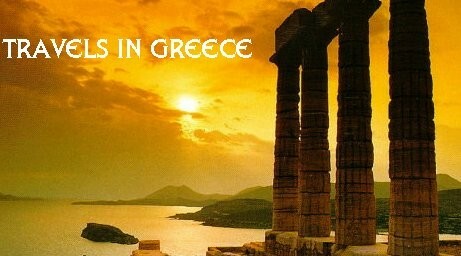 In surveying the Web I noted that there are not many good pictures of Athens, or even the Acropolis itself available. This is my attempt to fill that gap, and to provide as entertaining a narrative as I can. I have tried to make it equally useful and enjoyable to the student, the future tourist, the photographer, and the serendipitous surfer. Let me apologize in advance for any factual errors or omissions, or errors in understanding and translation. If you see anything that needs fixing, please let me know. Let me also apologise in advance for my well-developed sense of humor (my wife informs me that I have none). Thanks. Check you local library in the travel section for books on Greece. Also try the oversize books section. The World of Classical Athens, by Guilio Giannelli (©1966, Bemporad Marzocco) - with reconstructed models of the Acropolis and the Agora, and narratives on daily life in ancient Greece.